This display with USB interface provides an easy and straight-forward connection to modern systems. Inclusive power supply. By default there's a touch panel intergrated which allows any kind of input (tap and wipe). The real glass front is robust and hygienical for cleaning. Thanks to the OLED technology this display provides a non-reached ultra-wide viewing angle and contrast. Brand new are our graphic capability displays with USB connection and integrated touchpanel. The are good for wholesome control unit or as a display only. In addition to some serial interfaces like RS-232, SPI and I²C there are some digital and analoge in- and outputs also. With the use of those some simple control actions with fixed display content can be realized. Currently there are 2 sizes available with 2.9" and 82x67x21mm same as 1.7" with 55x54x21mm. Assembly is very easy with a simple put-into frontal plate and mount via self-adhesive stripes - portrait mode and landscape. Datasheet. Our serial devices are a dot-matrix LCD series of products that are ready for operation with a driver and a bezel or a snap-in housing. They are connected to a standard RS-232C interface (or, optionally, an RS-422). The data transmission rate can be set to 300, 1,200, 2,400 or 9,600 bps. All cursor control (line feed etc.) is automatic. The displays are equipped with LED lighting that can be switched off by software means. All displays except for 8- and 16-line displays are available for a 5V or 9-35V supply. Addressing: Thanks to selectable addresses, up to 64 displays can be addressed separately at a serial interface (EA OPT-DIP6). Prices as of 25 items begin at 78.22 euros*). Smaller quantities can also be delivered at short notice. You will find more information in our flyer and the data sheet. *) Prices quoted are inclusive of 19% sales tax. Dynamic dot-matrix modules permit 4 different font sizes to be displayed simultaneously. As a result, text or measurement values can be highlighted and are thus also visible from some distance. In this way, highly individual on-screen displays are made possible without the need for an expensive graphics module. Even small graphics such as icons or company logos can be loaded via the integrated RS-232 interface. All displays are equipped with LED lighting. Prices if you order 25 or more dynamic displays are between 53.30 and 195.30 euros*). Smaller quantities can also be delivered at short notice. More information is available in our data sheet, which is available in PDF format (german). LCD graphics units are intelligent graphics displays with a serial RS-232 interface. Two or three integrated character sets and a wide range of graphics functions permit the time- and cost-saving use of the latest LCD graphics displays. Apart from a supply voltage of +5V and RS-232 data, no further signals are required. No additional software or special drivers are required for their operation. All the graphics routines are integrated in the display's in-built high-level graphics controller. This permits the creation of a clear and attractive display using only a few commands. All functions are positioned with pixel accuracy by means of x/y coordinates (e.g. draw straight line: G x1 y1 x2 y2). Prices for all graphics units if you order 25 are between 70.25 and 212.23 euros*). You will find more information in the relevant data sheets in PDF format. 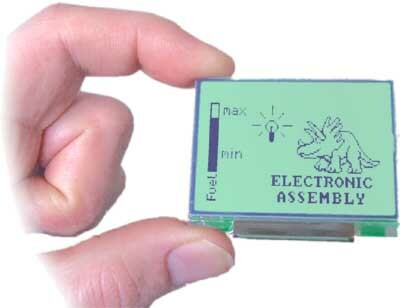 ELECTRONIC ASSEMBLY offers 3 LCD graphics displays in different sizes in a snap-in housing: EA KIT120, KIT128 and KIT160. 3 further sizes are available with an anodized mounting panel in black or blue: EA KIT240-6, KIT240-7 and KIT320-8. They are controlled via either an RS-232 or an RS-422 interface. A range of integrated fonts and graphics commands make it easy to program these displays: All functions are programmed with pixel accuracy by means of x/y coordinates (e.g. draw straight line: ESC G x1 y1 x2 y2). All displays are also available with an integrated touch panel: This allows you to make entries or change the contents of the screen by touching it. Smaller quantities can also be delivered at short notice. You will find more information on the touch panel versions in our internet page "TOUCH"
Has anyone not yet heard about how limited the command set of the HD 61202, SED 1520 or T6963C graphics controllers is? Often there is not even an integrated character set, let alone fonts of different sizes, straight-line routines and so on. ELECTRONIC ASSEMBLY is now offering for the first time a kind of “interpreter IC” with a high-level language as an add-on for many standard displays: And all this in a PLCC44 SMD housing. In spite of there being just 4 external parts (1 quartz and 3 capacitors), there are, among other things, 3 character sets of different sizes and a host of graphics functions available to you. Each function applies with pixel accuracy by means of coordinate entries (in “text mode” as well). You will find more information in our data sheets in PDF format. EA IC1520 / EA IC202 / EA IC6963. Samples are available ex stock normally.